Innovate for (social) impact ! Are you keen to be perceived as an innovator ? Having the mindset is a great first step for sure ! But 10 years from now, what should your name stands for ? – You enabled compact cameras to reach 12 Megapixel instead of 6 Mpix, thereby allowing an enhanced photo viewing experience for a large range of photo enthusiasts (incremental innovation). – You introduced a revolutionary way to work, be mobile and entertained with tablet-PCs, opening a new social communication and mobility era and replacing laptops (disruptive innovation). – You designed the 300$ house with electricity and clean water access, thereby opening the door to healthy living for millions of humans (radical innovation with “social” impact). All 3 levels of innovation have of course a space in the market with customers in need and money to be made. But today, it is mostly NGO’s, startups and former billionaire entrepreneurs, such as Bill Gates with its fundation (http://www.gatesfoundation.org) that have the devotion to invest in social innovation. Innovating for social impact in emerging markets with large growing populations that wish to evolve from being below the poverty line to middle class represents a significant revenue potential. All what is needed is long-term vision to invest in developing them now, while doing societal good. Audi group is one of these pioneering company in the social innovation field. They created ASI, standing for Audi Social Innovation that fuels such projects. 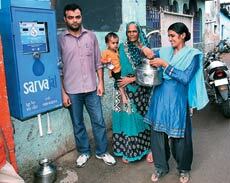 They helped for instance develop a solar-powered water ATM to bring affordable clean water into Indian slums with Sarvajal (http://www.sarvajal.com), a social enterprise created by the Piramal fundation (arm of the Indian Piramal conglomerate (http://www.piramal.com). The 300$ house (http://www.300house.com/concept.html) is another exciting idea ! Can you imagine the early volume-based profit and later brand benefits achievable for a real estate or building material company that would invest early on and market such houses in Indian slums, Brazil favellas and many other places, where impoverished masses suffer from insalubrity. So think about it: large markets with high growth normally belong to the matrix box “invest”. And on top you will polish your good citizen image and attract top employees ! You might say, I can’t, I have a differentiation strategy. Well, what about Audi…? If you are a social innovation pioneer, if you decide to Innovate for social impact, let me know…that might be my next post !